Rode on the trainer Tuesday for 45 minutes L1/L2. It was harder than it should have been...and that's ok since I did it. Tonight I'm shooting for an easy hour on the trainer and plan to venture outside on the bike over the weekend. My wounds are basically healed so I tried to swim last night. Lasted a little over 90 seconds and then had to stop since my ribs hurt too much...and that's ok since I tried it. I'll try again over the weekend. Rockstar Research says that a broken rib normally takes 4-6 weeks so I think I'm a little ahead of the curve. Weighed in this morning at Weight Watchers and gained 0.4 lbs...and that's ok since I went instead of hiding. Maybe I was burning a few calories working out that I need to adjust due to my comparitive level of inactivity? To prevent finding excuses not to go, I prepaid for the next month. Since I already paid I'm sure I'll go. Sometimes cheapness can be a virtue. My longest run since the accident has been across the parking lot...and that's ok since I made it all the way across without stopping. This weekend has yet another experiment on tap when I'll try to run a WHOLE LAP around the track. This will be at a pace no faster than a slow jog but I'll be happy if that happens. It might actually be slower than walking...and that's ok too. Training will resume in earnest on Sunday with a plan to run a marathon (not NYC) as soon as practical...and that's more than ok. 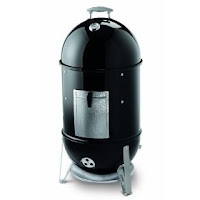 I bought a smoker, a Weber Smokey Mountain. Ordered it online. Why did I order it online? It was 20% cheaper than the local stores with free shipping. It came in a couple of days and when I put it together I found that one of the parts (the charcoal grate) was for a different size smoker rendering mine useless. So I called Weber customer service. After explaining the deal to the rep, the said that they would Fedex out a replacement part. I thought that OK and expected it in a couple of days at the latest. A week later no part so I called them again. After waiting on hold for about 20 minutes I got a rep who said that the part was backordered and they expect it in about a month! Then they would send it to me but since I was probably not the only person waiting for this part I should expect it early November. I tried to explain to the rep that this was unacceptable, found it incredulous that Weber had no parts, and that my option was to return it and buy a competitors' product. They didn't get it or seemed that they didn't care. I asked for a supervisor hoping there was some intelligence up the food chain. I was on hold a few minutes and then got cut off. Rather than wait on hold to complain again to people that don't listen I figured out Plan B. I would go to either Home Depot or Lowes and buy another of the same Weber smoker, take the part out (what I was asking Weber to do but they couldn't understand that), and return the whole thing for a refund when I get the replacement part. I had a bit of a moral internal debate since this may not be the fairest thing to do to these stores but figured it would all go back to Weber. Lowes was sold out but when I went to Home Depot, they had the part I needed that they sold individually. $9. I bought it. Problem solved. A simple solution to a simple problem that would have turned an unhappy customer into a satisfied customer. Weber somehow doesn't understand that simple concept. Maybe I was dealing with someone having a bad day or someone who shouldn't be in a job dealing with customers. In any case, I'm wondering if I'll ever get the correct part from them. Hope to do the first trial/experiment this weekend. I sense that a smoker is best operated with a beer in one hand and close proximity to a football game (or perhaps "games") on TV. Probably won't help with the weight loss diet so much. I won't be racing this weekend so I have some time to figure it out. I'm still investigating new aches, bruises, and pains but the pieces of glass are almost all out of my body (at least I hope they are). There are all sorts of stages that my mind is now going through that I'm sure some PhD types have defined much better than I would ever be able to but I have been amazed by the support that I've gotten from friends, family and even complete strangers. Mighty Hamptons Tri on Sunday will happen without me. The likelihood of doing the rest of my 2009 race calendar on the road to the NYC marathon is low. The likelihood of the marathon itself grows slimmer every day. But I am alive. A lot goes through your mind in the split second when you realize that there is nothing you can do to not crash. I wondered how fast I was going (22.4mph was the answer) and what my chances were (not great). I'm still sorting out the other thoughts that were racing through my mind at that point. I realized that I can look at this as a "why did this happen to me?" moment and be angry. I may look it it that way soon but I've decided to view this as I was lucky and it could have been much worse. I feel that I am now at the entrance ramp to the road to recovery. MrsRockstar asked me today if I was afraid to get back on the bike and ride. I can't physically ride yet (I hope to return to work on Monday) but I did set up my road bike on the trainer. I think that would be a good step once I'm ready physically. Won't be today but hopefully will be soon. I'm not going to wait until then to say thank you for the help. Expressing gratitude is not one of my strengths so I'm trying the best I can to give thanks where it is due. I can't say thanks enough to all the people that are helping me through this. Thank you for the support and thank you for everything else. It means more to me than I can write or say. Thanks. This week I lost 8.6 pounds. Let me say that again - this week I lost 8.6 pounds. I weigh less than an eighth of a ton for the first time in a long time. While I don't expect to lose this amount every week, I feel it was a good start. I like saying it so here it goes again: This week I lost 8.6 pounds and now weigh less than an eighth of a ton. Of course it won't matter if I just put the weight back on and this week is looking like it will be a challenge. On one hand I've got an open water swim followed by a 2hr ride (where I'll preview the Mighty Hamptons Bike Course) and on Sunday a 9 mile run. On the other hand I'm hosting an end of summer barbeque with friends on Saturday and TeamRockstar is going to the US Open to watch some tennis on Monday. MrsRockstar commented that I may weigh less now that when we got married those many moons ago. I don't know if that is true or not but it is a good thought. A few more pounds and I'll know that it is true. I also know that continued focus on my body composition is one of the keys to my athletic success. In 525,600 minutes - how do you measure a year in the life?" A year ago today I started on this triathlon journey seriously. Before that, while I competed in a variety of events and thought I was focused properly , my goal was simply to finish whichever event was next on the agenda. On some level with those goals, I was successful. When I originally signed up for 2009's Eagleman Ironman 70.3 in Summer 2008, I had a change of mind or perhaps an evolution of my mindset. I no longer wanted to simply finish but I wanted to do well. Of course, defining "well" was ambiguous at best but it was a goal none the less. I mark September 1, 2008 as the tipping point in this journey as it was the day I signed on to start trying to listen to the sage advice offered by BikeMike. At that point, I couldn't run since I was injured but no one could really tell since I normally ran very slowly. My biking endurance was OK but I didn't have a lot of speed. My swimming was best described as poor and was poor only with the aid of a wetsuit or pull buoy. I'm sure my Oly tri overall would have been better too but the only race at that distance scheduled this years had the swim cancelled. I do have high hopes for the Mighty Hamptons scheduled for 9/13. And I finished two Ironman 70.3 races, a distance that I never competed at before. While I'm still not up to the performance standards I've set in my mind not at the body composition that I hope for, I am making measurable and, I think, significant progress. There is some debate on this (mostly with the voices in my head) especially after my Timberman performance but over all I believe I am headed in the right direction and that more improvement is still possible. The journey is continuing. Mighty Hamptons Olympic distance triathlon in less than two weeks.